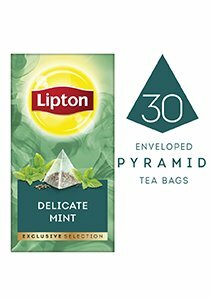 Why does Lipton Delicate Mint Tea taste so good? Because the roomy pyramid bag lets this refreshing herb infuse beautifully. The blend provides exhilarating flavours and is naturally caffeine free. We include large pieces of plant for a fresh and natural taste, together with a pyramid tea bag for better infusion of mint. Enveloped to protect all the flavor and aroma. Ambient (Store in a cool, dry place). Add a twist of lemon.